Replies will be made only to requests received from within British Columbia and Yukon. 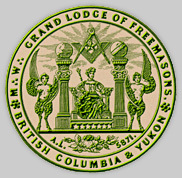 For contact information for the Grand Lodge in your area, please see <freemasonry.bcy.ca/links/gl_list.html> or do a web search with the expression, "Grand Lodge of [insert country or state]" inside quotation marks. Please email our Grand Secretary's Office with your full name, street address and Postal Code, full telephone number and email address, and any questions. Include "I am interested in joining Freemasonry" in the subject line.